Santa Monica’s Tacoteca has a lot of collaborative clout, with Umami Burger’s Adam Fleischman teaming up with Chef Ricardo Diaz (Guisados, Colonia Taco Lounge, Cook’s Tortas) to bring a refined Mexican street food concept to the westside. Tacos may be the title feature of this eatery, but make no mistake: its bar program steals the show. Several sips into one of head bartender Gilbert Marquez’s mezcal-based masterpieces, I heard myself utter the words, “We need to come here more often.” Coming from an eastsider, that's saying something. The tapas-style tacos are not to be missed—we enjoyed the grilled shrimp, seared ahi, lamb barbacoa and chorizo varieties—but they were hastily devoured as we shifted our focus entirely to Tacoteca’s liquid realm. If you’re a fan of mezcal, there are more than 90 to choose from, with mezcal flights also available. 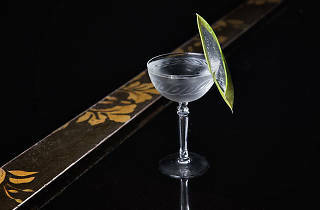 For skeptics, there’s always tequila, but we’d encourage you to experience the artistry of Marquez’s cocktails, which use unique and unexpected ingredients to either enhance or subdue the spirit’s signature smokiness. With an array of equally novel garnishes, you may even develop a taste for crickets. Good for: If you live on the westside, congratulations—you just found your new post-work happy hour/date night spot. If you don’t, here’s a good excuse to meet up with those cross-town friends you’ve been neglecting. Just make sure someone else drives, because you’ll want to try every cocktail on the menu. The scene: Tacoteca’s atmosphere is definitely more geared toward dining than drinking, with limited seating at the bar and table service everywhere else. Behind the bar, a fraction of the mezcal selection is on glimmering display as the bartenders create and disperse their magnificent concoctions to customers and servers. Framed tiles and beaded chandeliers accent the relatively minimalist space, where co-workers and friends casually drink up and chow down amid the dull roar of Latin music. 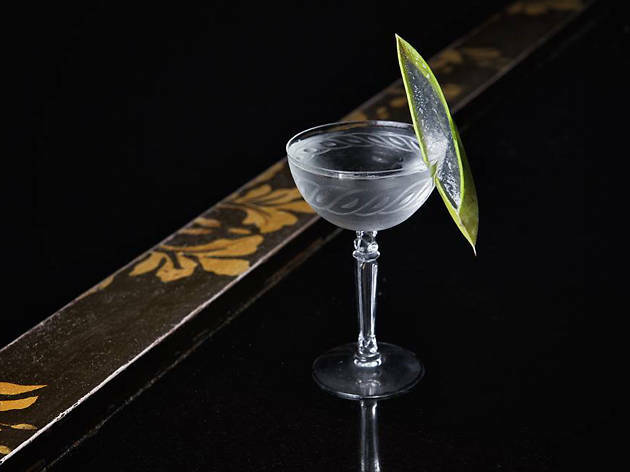 Drink this: Starting on the smoke-heavy side of the spectrum is the La Bruxa ($13), an unexpectedly spicy combination of jalapeno-infused mezcal, banana, cilantro and lime. The addition of activated charcoal not only embraces the “campfire” flavor often associated with mezcal, but also gradually sifts down from the top of the drink to create a delicate two-tone effect. The manly Mexican Standoff ($13) spares any such theatrics, going straight for the jugular with a strong punch of mezcal, aged rum and house-made falernum bitters. Heading into lighter territory we discovered our favorite drink of the night, the indescribable Aguacatero ($13). An iridescent pale green creation made with mezcal, green chartreuse, lime and avocado, it had a smoothness and earthy flavor unlike anything we’ve tasted in recent memory, including the cricket garnish. Almost as enticing was the Santa Vera ($12) a subtly sweet blend of mezcal, aloe liqueur and homemade pistachio orgeat topped with meringue. Decadent, dessert-like, yet surprisingly light, it’s an excellent way to round out your mezcal education. Our Tip: For an extra $2, you can order an orange slice with crickets and worm salt, smoked spiced chocolate or cucumber and tajin to accompany your mezcal. Ask your server or bartender for recommendations on what pairs best with what you’re drinking. And for God’s sake: sip it, don’t shoot it. Tacoteca is a great happy hour spot, but some of the best drinks aren't on the happy hour menu. It's worth it to pay a little more for a better drink if you're there in the early evening. The octopus taco is really tasty, but it's very rich—which is a good thing, because at $6.45 each, you should probably only get one. Most of the tacos on the menu are $4.75-6. Spend your money on a better drink and just get one taco and some tomatillo guacamole.